I know that Western Civilization began with the Greeks and was systematized by the Romans and inspired by the Judeo-Christian religions. But the creation of a Europe focused not on the Meditteranean Sea but on the continent north of Italy began in Aachen some 1200 years ago. It is here that Charlemagne started an idea that is finally catching Ming to fruition. First we had to get there. 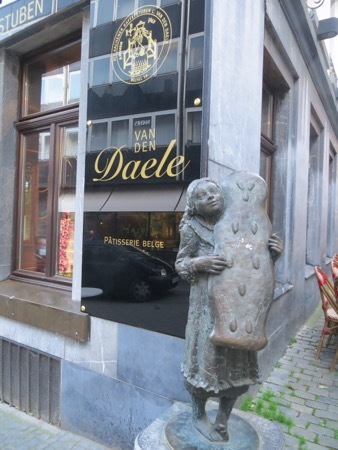 We enjoyed a hearty breakfast at our little barge hotel and began the trek across Belgium. 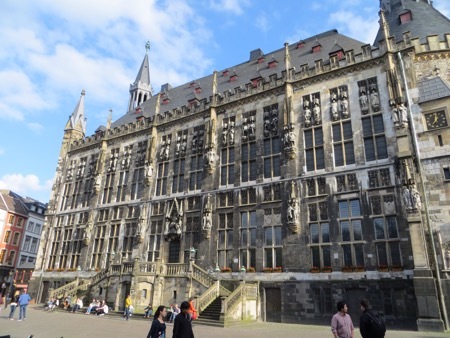 Aachen is located right on Germany’s border with Belgium and the Netherlands. 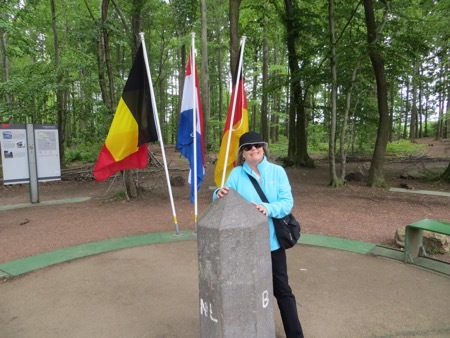 In fact our first stop was at a spot on the map where you can stand in all three at the same time. 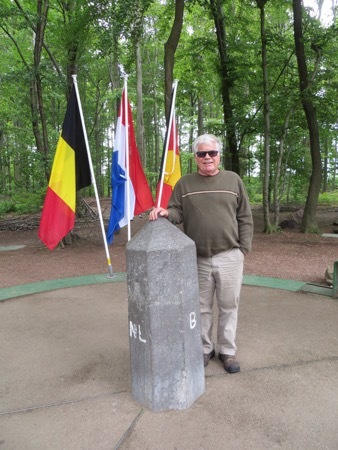 The place pushes the love of towers and monuments to the max. 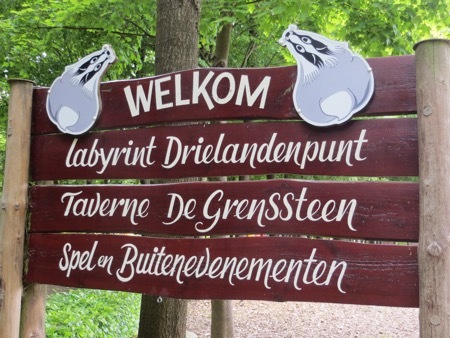 There are even labyrinths and plenty of beer gardens to celebrate the peaceful coexistence of these remarkable countries. 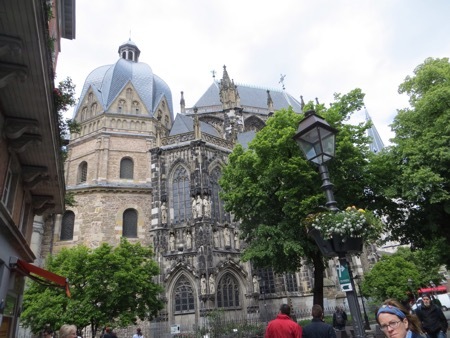 We didn’t spend a bunch of time there as we needed to venture into Aachen. Tom led us there but I missed a turn and had to drive completely around the inner city street twice. Almost hit 2 or 3 hundred bikes and several thousand pedestrians and avoided colliding with giant triple segment, caterpillar like buses. I finally followed Tom’s instructions and turned into place marked only for taxis. Twisting through pedestrians and double parked delivery vans on a cobble street 12 feet wide was no fun. I double parked in front of the hotel and left a wide eyed Peggy in charge of the car. I was relieved to find that the subterranean parking garage was only two quick rights. We descended after watching another patron emerge from the darkened garage. 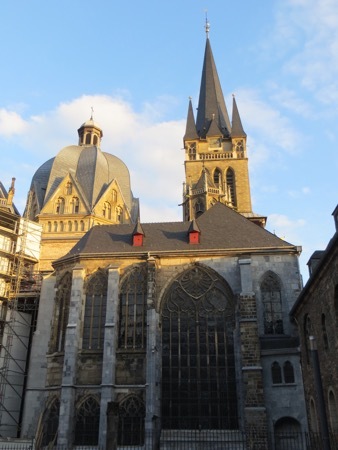 We left our stuff in the secure garage and headed off to the cathedral of Charlemagne some two hundred yards away. The English language tour had to wait an hour. It was time for some wurst. I assured Peggy that as long as the ingredients did not include “blut” or “leber” that she would be OK. 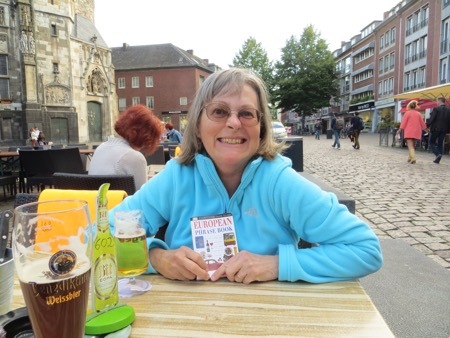 I was ready for a local beer and enjoyed my classic German bratwurst, fried potatoes and large beans. The meal was interrupted by protesting Kindergarten teachers. They all wore red labor bandannas and were accompanied by police as a thousand or so marched through the streets. We would have pictures if we knew why they were marching. Time for some labor solidarity. 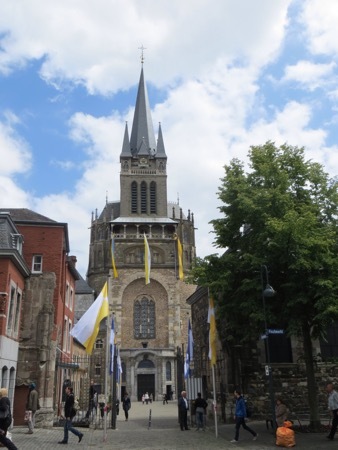 We joined our English language tour of the cathedral started by the Belgian Charlemagne shortly after he was crowned as the Holy Roman Emperor by the Pope in Rome on Christmas Day, 800. 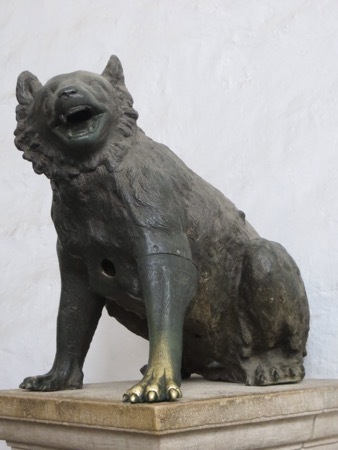 He then declared that we would act like an old Roman Emperor and settle down in his own new “Rome” in Aachen. He had taken up residence there a few years earlier and added the cathedral to his palace which no longer exists. 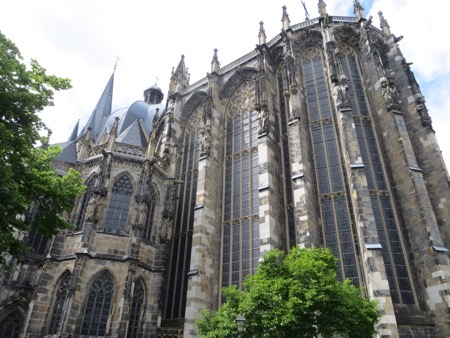 In fact, the cathedral managed to survive the destruction of WWII that damaged 80% of Aachen. 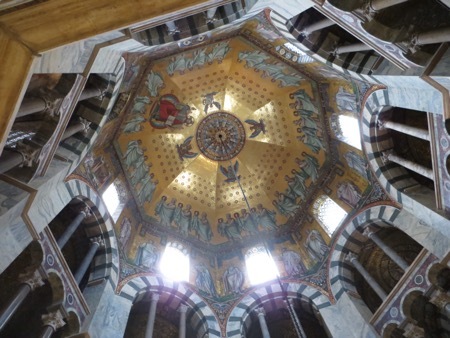 Charlemagne modeled the octagonal cathedral after the basilica that the Emperor Justinian constructed in Ravenna. 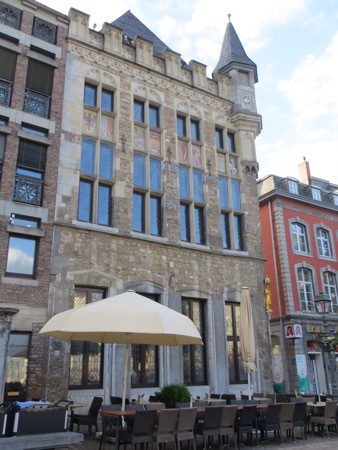 The central core was built during Charlemagne’s reign but the entire place has been added to and remodeled numerous times. 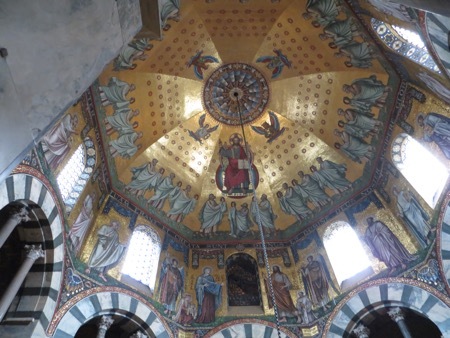 In the nineteenth century mosaic tiles and designs reminiscent of Ravenna were added. 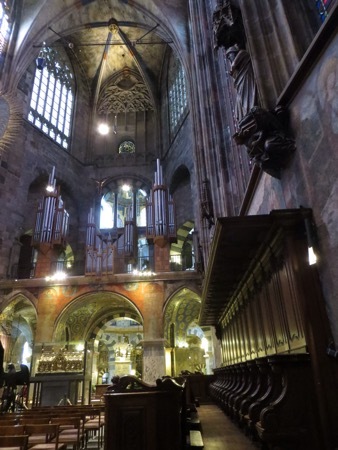 Also added was a new Gothic apse and chapels. The overall effect is somewhat strange but no more so many other places continuously occupied for centuries. 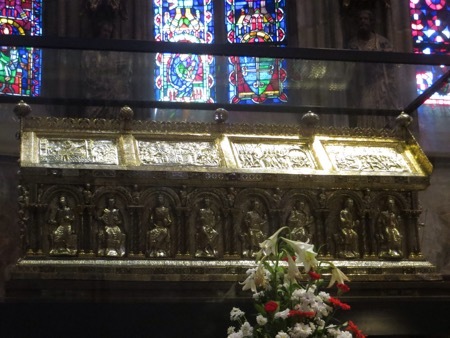 Located in the apse / choir is a “gold” casket from the 13th century that hold’s Charlemagne’s bones that were moved from the purloined Roman marble casket which held his body for some 500 years as he was exhumed and relocated in the new Gothic section. 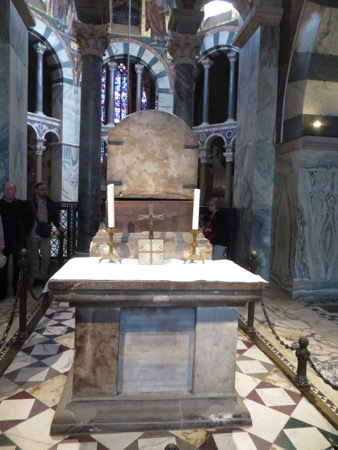 Since the cathedral is actually dedicated to Mary, it is fitting that there is a reliquary in the apse that contains diapers of the baby Jesus, the robe worn by John the Baptist at his beheading and a couple of other items that I forgot already. The issue of relics and their rejection by Protestants is not needed at this time. Just say that the reliquaries are magnificent and inspired in their craftsmanship. 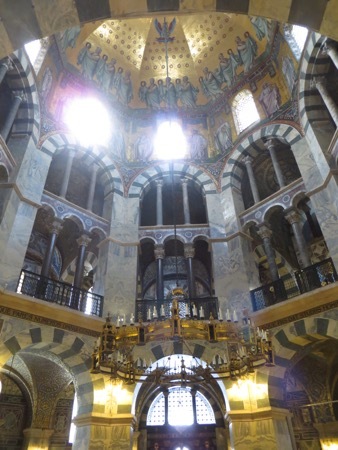 As part of the paid tour, we went upstairs and saw the throne of Charlemagne. 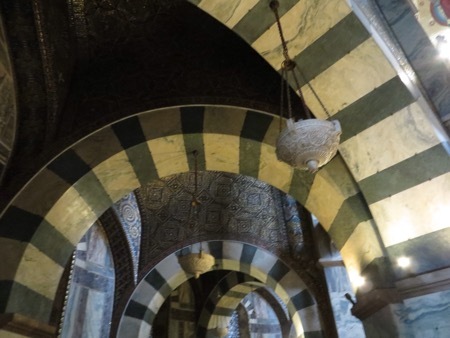 It was constructed of marble taken from the Church of the Holy Sepulcher in Jerusalem. 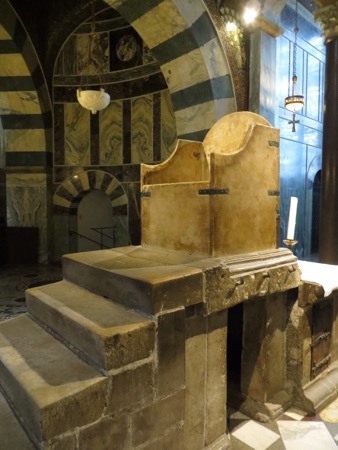 For 600 years, subsequent German Emperors were crowned while sitting in it. 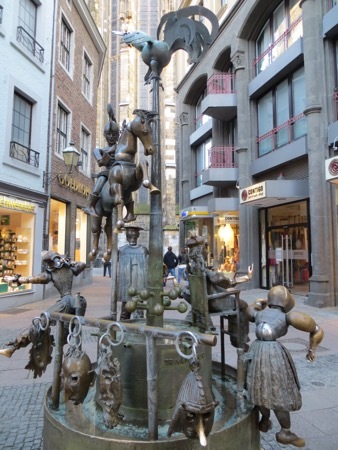 The Hapsburgs moved the process to Vienna in the 1500’s but left the plain vanilla throne in Aachen. 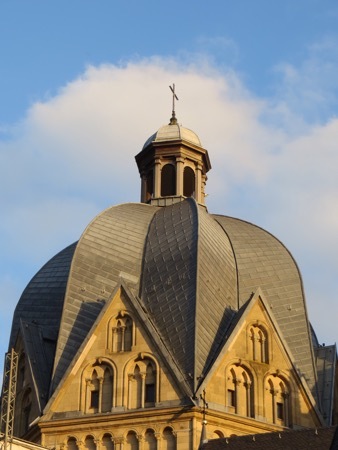 Given the frequently violent history of this region, the survival of the church is indeed miraculous and is the real relic to be enjoyed today. 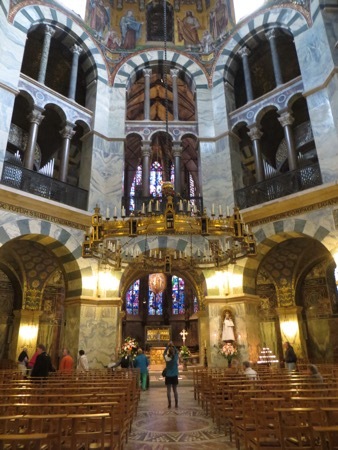 We toured the cathedral treasury and saw the famous bust of Charlemagne and plenty of relics and ancient prayer books and gospels. Some of the 800 year old robes were in better shape that much that resides in my closet. They were also a bit fancier. As I was reliqued out, we returned to the hotel and sacked out. Back to the beginning. Charlemagne divided what is essentially the modern European Union that he created during his lifetime amongst his three sons. 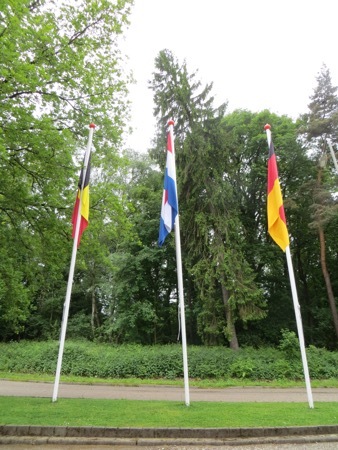 One got France, one Germany and the other the Middle Kingdom that includes the rich lands of the Rhine, Burgundy, the Low Countries and Switzerland. Almost all of the European conflicts of the last thousand years have fought over control of this middle part of Charlemagne’s empire. It is also in this middle ground that modern Europe looks for governance in places like Brussels.. 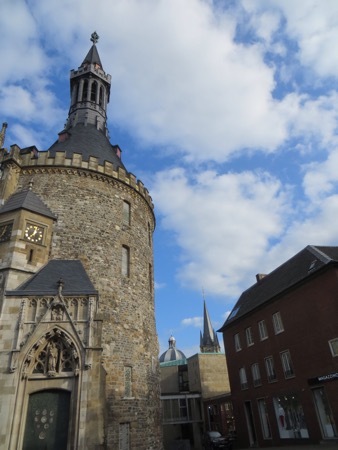 Yes, Aachen is ground central for modern Europe. Time to go look for some authentic German atmosphere. It is now 9:30 and we have finished our dinner outside on the Market square in front of the Rathaus, German for city hall. Nice meal of white asparagus, potatoes and ham followed with Apple Strudel and a few wheat beers. Very enjoyable. We wandered around the evening crowds. 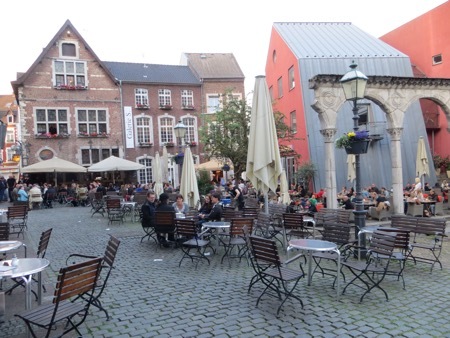 It seems that if it is not raining or snowing, the Germans prefer to eat and gather outside. 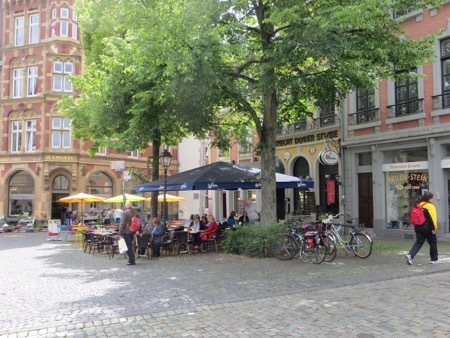 The atmosphere is quite charming in Aachen with a combination of ancient and the modern. 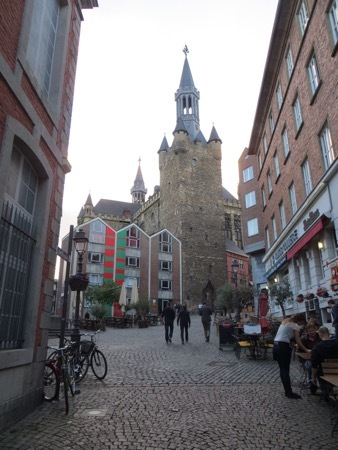 Wonderful to see Charlemagne’s seat of power! I’ve taught that place so many times, but haven’t seen it yet. He’s one of my heroes. Just the mention of all that German food and beer brings back such memories of trying to find lighter food. At last, found a vegetarian crepe–and it arrived smothered in pork gravy!